MARANA, AZ — Taking its name from one of the longest living trees in the Arizona desert, the 129,000-acre Ironwood Forest National Monument, a true Sonoran Desert showcase, is expanding. 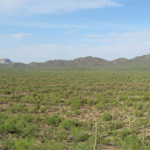 Arizona Land and Water Trust (Diana Freshwater, president) recently secured 602 additional acres for $963,000 ($1,599 per acre). Keeping company with the ironwood trees are mesquite, Palo Verde, creosote and saguaro, blanketing the monument floor beneath rugged mountain ranges named Silver Bell, Waterman and Sawtooth. In between, desert valleys lay quietly to complete the setting. The newly secured property was surrounded on three sides by the national monument, with no other access. 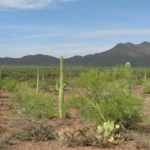 Arizona Land and Water Trust works closely with local, state and federal agencies, as well as private landowners and land trusts, to protect Arizona’s vanishing landscapes and wildlife habitat. The Trust helps structure, negotiate, and complete land transactions that help protect natural areas such as this property. Carl Mickler with Centra Realty of Tucson represented both buyer and seller, the Torrance Potter Family Trust, in the transaction. Located in northern Marana, west of Silverbell Road, the property has physical access to Ragged Top Road. Elevations in the national monument range from 1,800 to more than 4,200 feet. Three areas within the monument, the Los Robles Archeological District, the Mission of Santa Ana del Chiquiburitac and the Cocoraque Butte Archeological District, are listed on the National Register of Historic Places. Known for its primitive camping, hiking, mountain biking, wildlife and plant viewing, horseback riding, photography, sightseeing, wildflower viewing in spring, hunting, birdwatching, fossil and geologic sightseeing, historic and archaeological sites, Ragged Top Mountain is the biological and geological crown jewel of the national monument. 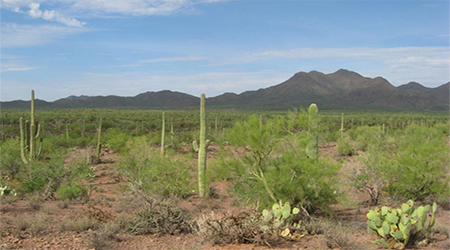 Several endangered and threatened species live here, including the Nichols turk’s head cactus and the long-nosed bat. The national monument also contains habitat for the cactus ferruginous pygmy owl. The desert bighorn sheep dwelling in the region are the last viable population indigenous to the Tucson basin. The area holds abundant rock art sites and other archaeological objects of scientific interest. Humans have inhabited the area for more than 5,000 years. 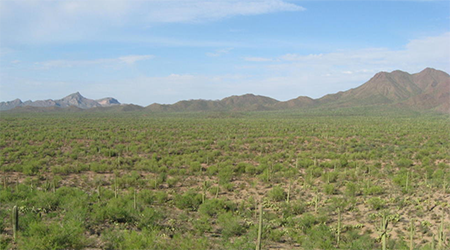 More than 200 sites from the prehistoric Hohokam period (600 A.D. to 1440 A.D.) have been recorded in the area. In more modern times, the area was a source of minerals and continues to support active mining operations today. For additional information, Mickler should be contacted at 520.882.0767. To learn more, see RED Comp #4107.